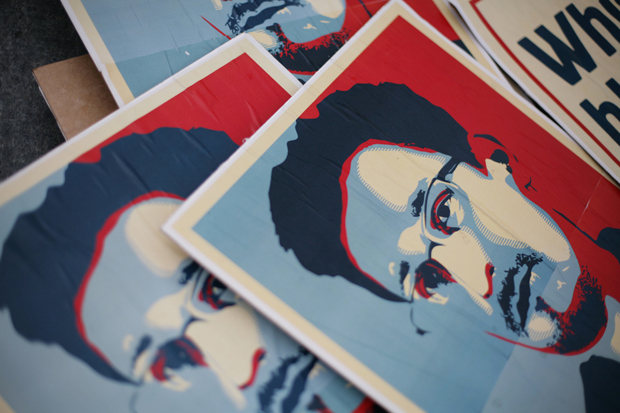 Roman Dobrokhotov has some words of wisdom for Russia's newest resident, Edward Snowden. Translated by John Crowfoot. Yesterday I learned that you have managed to gain temporary asylum in Russia. Congratulations on behalf of progressive people everywhere. At last, you are safe. Here in Russia no one would dream of harassing you for exposing the security services when they listen to telephone conversations and read others letters without a warrant. Russia, thank God, is a law-abiding State and ever since 2008 our security services have had a quite legal right to listen to whatever people are talking about on the phone and to read their e-mails. Everyone is aware of this, and there is nothing here in Russia to expose. While you are only just beginning to get acquainted, however, with the aspects of liberty in our society, let me give you some modest advice. Russia, It goes without saying, has its own way of doing things and it would be better if you knew about this in advance. One, feel free to take up whatever activity you like. This is not the USA, Ed, where exposing the activities of the government carries unpleasant consequences. There is nothing of the kind here. On the contrary, people who expose the American government are given all kinds of rewards and can enjoy a fine career, which I wish for you. I would just remind you not to forget which government you are fighting against. For were you, in the heat of the moment, to get confused about this you would have to return to a little room again (and this time, most likely, it would not be at the airport). Two, it would be best, old chap, if you grasp from the beginning that Russia is a spiritual country. Perhaps in the USA they taught you that Russia’s wealth lies in its oil and its timber. Well, that has long ceased to be the case. All the oil was stolen back in 2004 by Mikhail Khodorkovsky and all our forest reserves will soon have been stolen by Alexei Navalny. So today our spiritual wealth can best be expressed as “Orthodoxy, Autocracy and Populism”. Orthodoxy is a very liberal religion. You may drink alcohol, eat pork, or, like Abbot Timothy, drive your BMW roadster while under the influence – in short, do whatever you like. You mustn’t dance, that’s the main thing. Dancing is a crime. But you’re no dancer, Ed, so it’s not a problem as far as you’re concerned. Autocracy is Russia’s form of democracy. It’s very spiritual and you’ll like it. Every few years we re-elect Vladimir Putin. Putin recently caught the biggest catfish in the world. The very biggest was caught by Lukashenko. That’s all you need to know about politics in the Commonwealth of Independent States – if you don’t want to return, that is, to a little room in a hotel somewhere like Krasnokamsk. Populism: that means the national spirit and you can get acquainted with it by listening to the songs of Stas Mikhailov, though my advice to you would be, Don’t. Three, please don’t imagine I have any objections, it’s a matter of indifference to me, but it would be better if you’re not gay. If you are, well, don’t leave the hotel. If you’re Jewish then you won’t be able to work as a rural schoolteacher. Does that strike you as silly advice? Ed, I know what I’m talking about. Take my word for it. I hear that your defence lawyer Kucherena has given you Crime and Punishment. It’s an excellent book. Do read it, and do so BEFORE you encounter a certain middle-aged lady called Yelena Mizulina. Don’t do anything you might come to repent of later! No matter how noble the idea that guided your actions. Lastly, a couple of practical suggestions. Do not commit any offences when you’re out driving until you have been elected deputy of one assembly or another. Don’t waste your money buying a flat – all you have to do is become friendly with Ramzan Kadyrov. Learn to play badminton and if someone offers to help you run for Mayor of Moscow, do not agree. It’s a trap! There are three simple rules you must remember: Do not wear white, at least not when you’re near Bolotnaya Square; Don’t walk about in tight-fitting garments anywhere within sight of the State Duma; and Don’t Dance within the vicinity of a church. It would take at least as many words as the author uses to decipher the allusions in this short letter. Here it’s worth noting the following. In 2008 the various Russian security services were allowed by law to use a “technical system to support investigative activities” (its acronym is SORM) which gave them access to communication networks without seeking prior permission. Such access is now a condition of registration for any new website, and providers must foot the bill themselves for installing the necessary equipment and software. For an account of SORM in action see this link. Why Duma deputy Yelena Mizulina, singer Stanislav Mikhailov, rural schoolteacher Ilya Faber and Abbot (higumenos) Timothy have become famous or notorious can be learned from the Internet. The author of the letter Roman Dobrokhotov is a Moscow-based blogger, and a journalist with the internet news-site slon.ru. In 2012 he was described by Al Jazeera in the following terms: “Roman has been arrested 120 times. His actions – part performance art, part comedy and part political statement – are daring and entertaining but his cause is deadly serious.” Dobrokhotov’s targets, according to the TV broadcaster, are “Putin, the Orthodox church and ultra-nationalists”. What classified info.? The U.S is racist and college baseball stats are fake. Congratulations Snowden. Macho, macho man, you wanna be a macho man. Now, the US doesn’t exist where you live & you never again have to put up anyone here. Macho, macho man, you wanna be a macho man. I remember all the passive aggressive, hectoring messages sent to the various Iranian, Russian and Chinese “dissidents” given asylum by the United States, detailing the numerous ways the American government cracks down on freedom, both home and abroad. Oh, whats that? That never happened? Odd, because one might surmise a quite nakedly, transparent pro-American viewpoint hidden in this diatribe (How dare Snowden seek asylum in Russia which does all these terrible things and treats whistle blowers so much more harshly than that soft, cuddly beacon of freedom, the United States!) That can’t be true because this site is only about free speech!™ and doesn’t have any such biases towards Western governments, now does it? Anyway I look forward to the article passive aggressively questioning an Iranian (Or a Chinese, Russian etc.) on how dare he ask for asylum in the United States, when that government is busy drone striking mostly innocent people, conducting mass surveillance foreign and domestic, has the largest prison population in the world and 25% of all global prisoners with a disproportionate amount of minority groups, and is far less forthcoming in providing asylum to residents of say, Honduras and Haiti. I am sure it is forthcoming. Fantastic translation, we can learn a lot from the Russian progressive movements, hell, even the National Bolsheviks. How could the classified information be protected for the safety of one Country and also made sure that the citizens of that same Country are not the target of that top secret, like in the 9/11 false flag attack for example? Should State secrets exist? If State secrets were to be eliminated only in a certain Country how could this Country then protect itself? For example, if the United States were to divulge every secret then how could they do it without the risk of remaining victims of their same disclosed secrets? Is it possible to balance the power between secret State Agencies and the right to know of every citizen? Secret State Agencies have always been the stations to enroll new “initiated” and are still today the alcoves where the darkest ideas have been plotted in the name of a “Greater Good”. To accept that such relevant secrecy is reserved for only a few individuals is to also accept that non governmental secret societies will continue to flourish behind closed doors and to advance their agenda while they remain well hidden from the eye of the unaware citizen. Any head of secret service should never become president of a Country, like in the cases of Bush or Putin. To know everything about everyone is a weapon like no others and that is also the shortest course for a Democracy to be turned into a Dictatorship. The secret State Agencies will be those to pave the way for a New World Order. The current system of government seems to offer no alternative. And from here is the need for a total renewal in the concept of government.